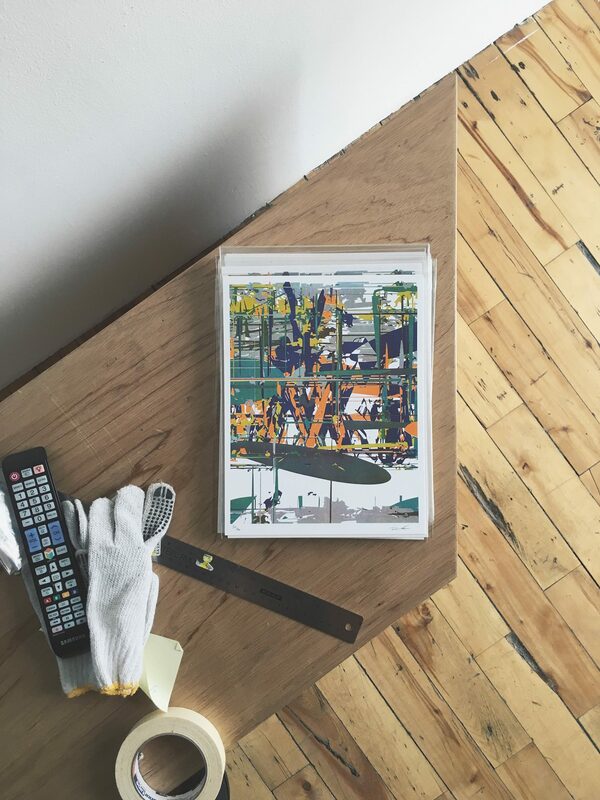 This limited edition risograph print by Brandon A. Dalmer was produced using the same processes that the artist employs in his paintings. Brandon's painting are created largely by replacing the artist's hand and decision making with a number of computer algorithms. Preselected comic book cells that have undergone heavy editing through Photoshop's content-aware function in order to eliminate characters, word bubbles, and meanwhile panes, are vectorized. These provide landscape images comprised mostly of color and line, allowing for an easier transition into vector images. These are then run through an algorithm which generates abstract compositions by intentionally corrupting the source .svg file. This process is repeated up to 50 times or more. Dalmer chooses the best image; it is then printed monochromatically using a plotting machine, cutting stencil layers from vinyl. These layers are then applied to the canvas. Colours are mixed using the Golden Acrylics Color Mixer, translating RGB and CMYK codes into pigment colour ratios. A laser engraving process is then used to remove certain layers to reveal the colours beneath them, while also adding to the computerized language used in these paintings. The resulting images draw attention to the new role artists may have available to them as technology progesses, and more complex methods become commonplace. This print is available for pickup in the gallery at 9 Ossington Ave.